At the time of the Terror model guillotines were a popular source of (somewhat nervous) amusement. Curtius made quarter-sized guillotines to adorn his waxworks. 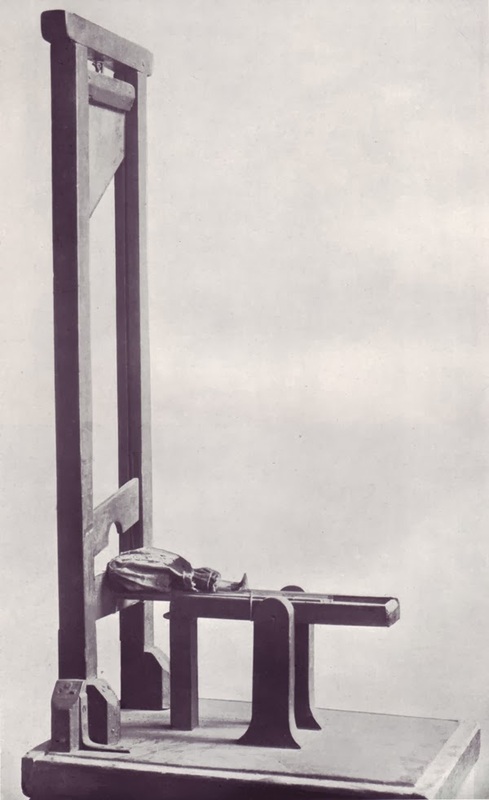 Miniature guillotines were sold for cutting bread and some salon hostesses even furnished tiny dolls, which looked like the enemy of the day, filled with "blood" (perfume) to fly out after decapitation. In Arras, according to one English eyewitness, children were taught to amuse themselves by making models of the guillotine, with which they destroyed flies, and even animals. "The worst monstrosity of the kind was the outcome of the French Revolution, which indeed was over-rich in aberrations of taste. The toy shops put on the market little guillotines with which little patriots could behead figures of aristocrats. There still survive some specimens of this pretty and diverting machine, of which one bears the date 1794 [above]. These were not models but pure toys; and in proof of this we have king's evidence from one whom we should never suspect of wishing to give so bloodthirsty a toy to his little son. This was no other than Goethe. In December, 1793, he asks his mother in Frankfurt to get him such a toy guillotine for his son August; and in her reply he certainly got some home-truths. In her decisive manner she wrote to him by return post: 'Dear Son, Anything I can do to please you is gladly done and gives me joy;--but to buy such an infamous implement of murder--that I will not do at any price. If I had authority, the maker should be put in the stocks and I would have the machine publicly burnt by the common executioner. What! Let the young play with anything so horrible,--place in their hands for their diversion murder and blood-shedding? No, that will never do!" The picture and the quote can be found in Will Schofield's blog of book illustrations: 50 Watts. See also: Pamela Pilbeam, Madame Tussaud and the history of waxworks, 2006, p.58. In Lyon in September 1792 food shortages and price rises combined with sharpened fears of counter-revolution to produce the first considerable popular unrest since 1790. The Musée Gadagne preserves a couple of interesting relics from this period, - a nasty looking iron pike, inscribed "Les Citoyennes de Lyon 1792" and a poster presenting a pricelist of basic commodities. Disturbances began on 9th September, when, in imitation of the Parisian prison massacres, eight officers of the regiment of Royal-Pologne held in the fortress of Pierre-Scize, were seized and killed together with three refractory priests,, and their decapitated heads paraded around the city. There followed two months of disorder which the mayor Louis Vitet and his supporters were unable to bring under control and which the National Guard made no serious efforts to stop. The crisis of food supply deepened. Shipment of grain along the Saône had entirely ceased and the authorities and merchants of Lyon bought goods only to have them stopped in transit in the districts of Tournus and Trévoux. The departmental, district and municipal authorities all sent out commissioners to search for provisions but in vain; on the 14th there were disorders in the market places and the Council for Rhône-et-Loire declared that stocks of grain were about to run out entirely. All goods were dear; the workers, who received their salaries in assignats were now paying almost double pre-Revolutionary prices. On the 15th a deputation of women presented a petition to the municipality, complaining that they "died a thousand times seeing their children go without basic necessities," and demanding that prices be lowered for basic commodities. Without waiting for a reply from the municipality, they drew up a tarif of goods, had it published and posted. ..... All those who conform to the will of the people, which is founded on justice, equity and equality, will be respected by their fellow citizens and will find in them faithful guardans of their property. Those who do not listen or who dare to show opposition will be subject to public scorn and regarded as traitors. All traders and merchants are invited to comply with the present regulations, and to sell their goods only at the same price as they formerly charged in silver currency." For a week grocers' shops were systematically raided in almost every quarter of the city. Goods were commandeered and sold off: "the people, almost the whole people, is raiding the shops to recover all the foodstuffs; almost all the women have come out to take them." (Report of the Municipality to Roland, 19 Sept. 1792) At least 113 grocers' shops were pillaged between 17 and 19 September and one wholesale merchant's stock of cheese, valued at 21,000 livres, was sold off in one day. The three administrative authorities, departmental, district and municipal met in common on the 17th, but a menacing crowd made its way to the town hall and pelted the grenadiers on duty outside with stones; someone set of a gun and several people were wounded, two killed and the town hall had to be evacuated. The municipal commissioner Bonneville succeeded in diffusing the situation with promises of measures to alleviate the food shortage. Next day, amid further scenes of pillage, the municipality finally capitulated: fearing that "the city would be put to the torch...and the majority of the wealthy citizens murdered", it decreed price controls for eggs, butter, meat and bread (the cost of which was thus artificially reduced from three sous per livre to two). However, the regulations had little real effect and on 9 October, after the agitation had subsided, the price controls were lifted. Contemporary observers were unanimous that the movement was spearheaded by the women themselves. 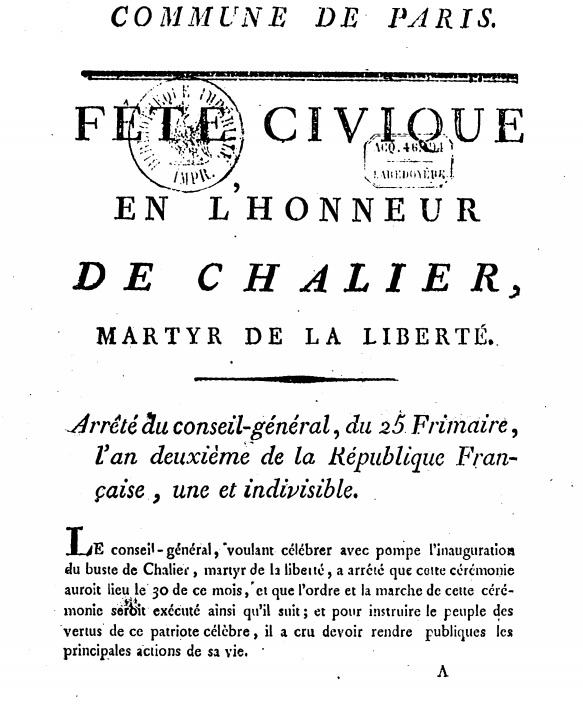 According to the Jacobin Laussel, the petition was instigated by some forward women and a few male supporters ["quelques femmes de la lie des coquines et quelques souteneurs en petit nombre" Letter to Roland, 22nd September] One "supporter" - probably Chalier's colleague Bussat - was certainly responsible for printing the poster. The notice shows that the women were aware of the current political debate, interpreting their own circumstances in the light of notions of popular sovereignty and direct action, as well as popular concepts of fair price. According to the Journal de Lyon of 20 September the women insurgents formed a "deliberating society". Female police commissioners ["commissaries de police femelles"] patrolled the markets armed with pikes to control any excesses. 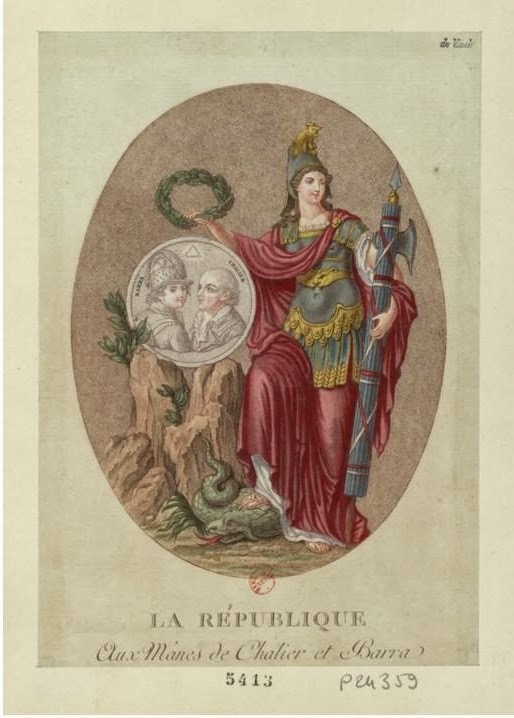 Women also subsequently participated in the clubs and the thirty-four sectional assemblies of Lyon during the campaign in October 1792 to raise the tarif for silk weavers - a proposed 33 percent supplement had the support according to officials of almost 3,000 people "especially many women". However, in November 1792 the authorities issued an amusingly pious declaration To the men and women citizens of the City of Lyon in which it called on the women to “return to your homes with confidence in your magistrates” and exhorted their menfolk to calm their wives, return them to their household duties and “keep them within the bounds prescribed for them by nature”. Musee Gadagne - Room labels in English. 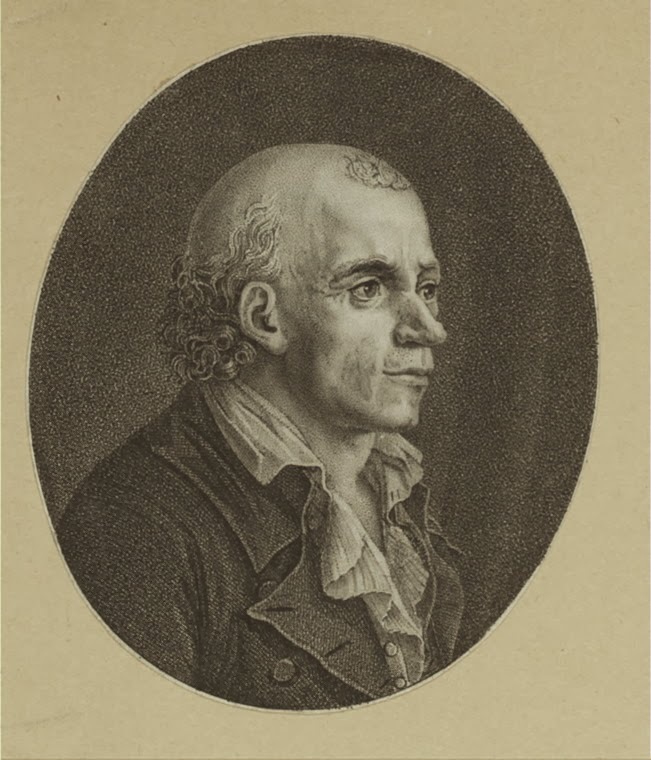 Maurice Wahl, Les premières années de la Révolution à Lyon, 1788-1792 (1894) p.604-5. Following on from the trompe l'oeil, here is a little more information on the Arras artist Domnique Doncre. Apart from a small exhibition Arras and Hazebrouck in 1989-90, Doncre has attracted little attention. Not quite in the top flight of artistic accomplishment, his works on public display are relatively few - though his output was prolific, many of his decorative creations were ephemeral in nature, and other pieces were sold off and scattered after his death because he lacked direct descendants. His career illuminates the questions of how to make a living from art in 18th-century France and, secondly, how to survive and prosper as a professional artist in the Revolutionary era. 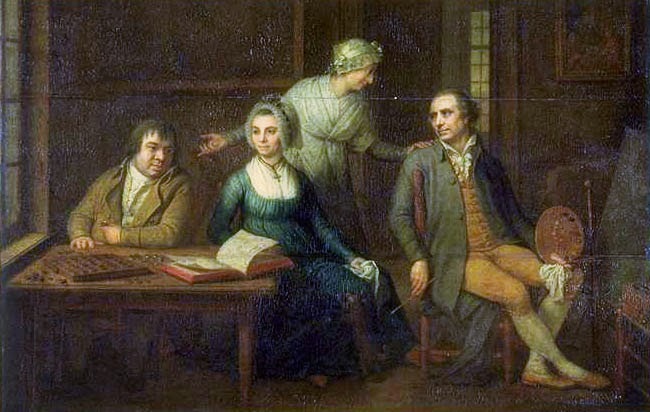 "Painted by Dominique Doncre, his pupil, in 1769"
Guillaume-Dominique-Jacques Doncre was born in 1743 in the Flemish village of Zegerscappel, ten kilometres south of Dunkirk. Nothing is known of his training as an artist - his virtuosity in trompe-l'oeil and grisaille recall the work of Antwerp artist Martin Geeraerts (1707-1791) which has led to the suggestion he studied there. 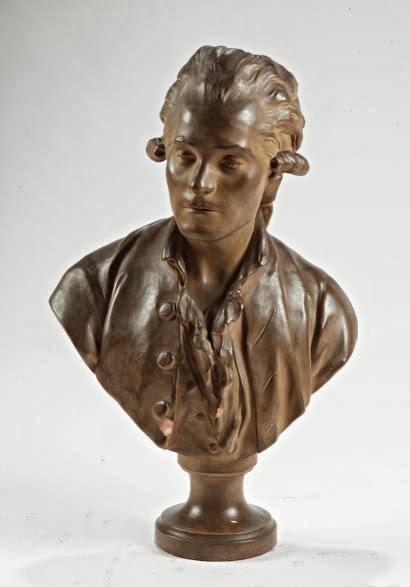 He probably started his career in Saint-Omer, where there is a 1769 self-portrait with the local sculptor Dominique Herment, in which he identifies himself as Herment's "pupil". By March 1772 he was firmly established enough in Arras to be made a bourgeois of the town and to join the local confraternity of Saint-Luc. He developed a clientele among the local noblesse de robe, particularly members of the Conseil d'Artois. Various decorative commissions and portraits are recorded: numerous fashionable grisailles, a Christ on the cross for the cathedral in Arras, a portrait of the bishop, Monseigneur de Conzié. 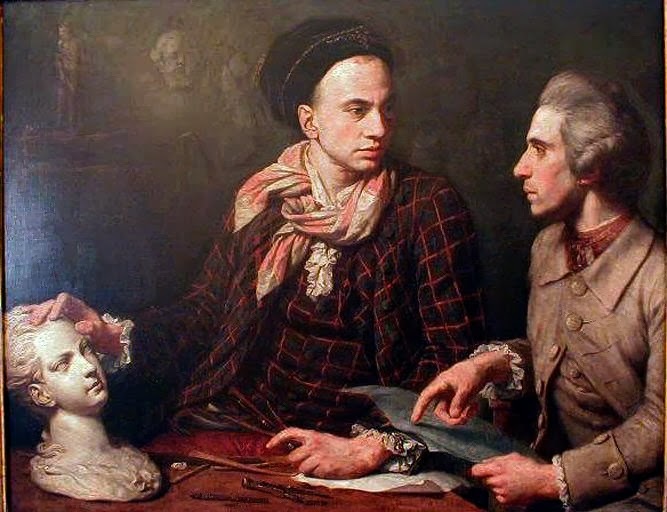 In 1783 Doncre was invited by the Imperial Princess Marie-Christine, wife of Albert duc de Saxe-Teschen to restore the picture gallery of the château de Mariemont at Morlanwelz near Mons. 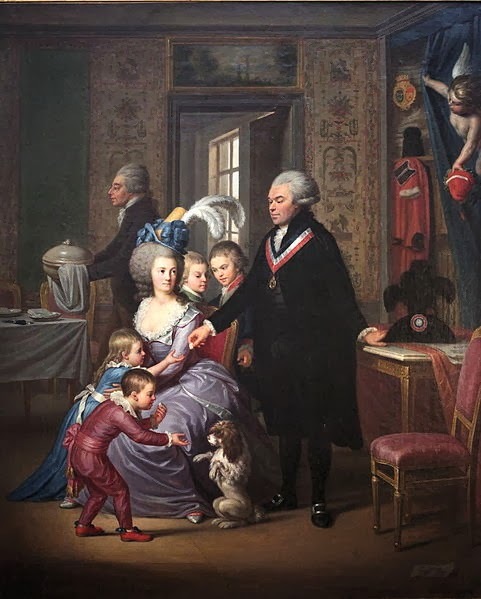 It was at this time that he received a commission for a portrait of Joseph II, later presented to the town of Naumur to mark an imperial visit there during Joseph's six week tour of the Low Countries in 1781. Amongst the princess's paid companions was Doncre's future wife Marie Agnès-Rose Dineur. Already in her forties when they married in 1784, Marie Agnès-Rose had a great reputation for beauty as well as for her sweet nature. She was a frequent model - the Flemish-born Doncre's taste in women clearly ran to the Rubensque! They had one child, a boy who died when he was three and was painted by his heartbroken father as an angel ascending to heaven. There is no real first hand evidence for Doncre's reaction to Revolutionary events. However, his biographer Le Gentil cites, with some justification, Sieyès's "J'ai vécu"; close as his relations were with the local nobility and haute bourgeoisie, Doncre's position no doubt suggested prudence. At first, at least, the Revolution allowed a measure of continuity. 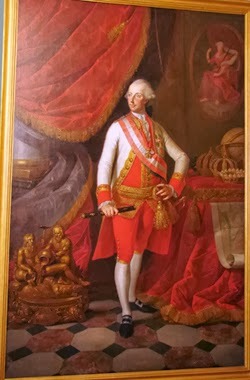 In 1984 the Musée de la Revolution at Vizille acquired a painting by Doncre, dating from 1791, which depicts a prosperous member of the Conseil of Arras. No doubt the Judge had been compensated for the loss of his magistracy, then re-elected - note the little angel or figure of liberty revealing his splendid robes of office. During the Terror Doncre was credited with exercising a mitigating influence though his friendship with the numismatist Effroy, the commissioner for prisons in Arras and one of the few men with the strength of character to stand up to Joseph Le Bon. Artistically, however, Doncre firmly towed the line. Inscribed on the back of the chair : "D.Doncre fecit 1794"
As we have seen, Doncre also drew and painted portraits of Revolutionary figures. 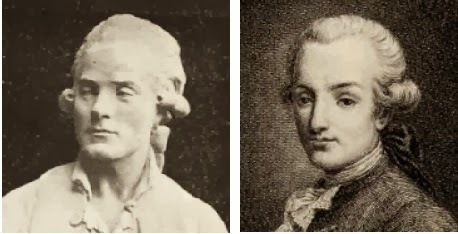 M. Le Gentil mentions a series of portraits "à la sanguine" of the members of the National Convention, Robespierre, Lebas, Lebon, Peltier, Combe-Sièyes. Other drawings, also in "trois crayons", depicted Arras notables such as the younger Robespierre and Demeuliez the public prosecutor. 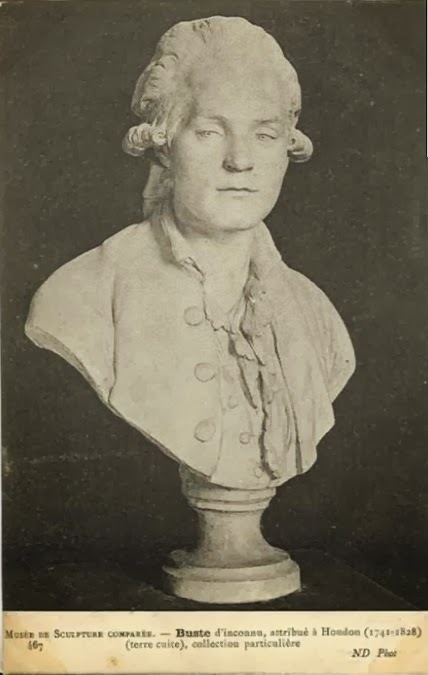 In 1906 the Pas-de-Calais Commission for historical monuments received notice of a fine portrait by Doncre in red and white chalk, thought to be one of Robespierre's three cousins on his mother's side, from the Carraut family, brewers of the Abbey of Saint-Vaast: "The Revolutionary is three-quarters turned, dressed in the costume of the day with a soft shirt and high collar, and with vivacious and intelligent eyes. He has fine long nose, thin and small lips, prominent cheeks, disordered hair - the portrait of a poet or a thinker." None of these drawings is traceable today, at least not on the internet. 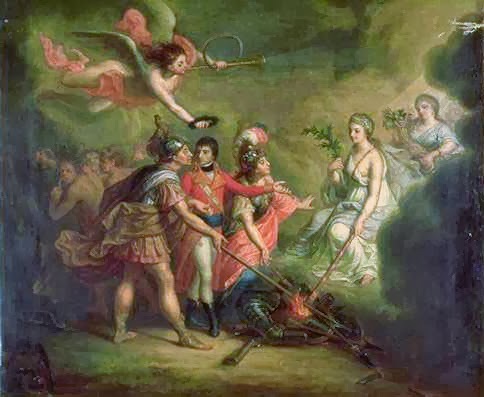 Under Napoleon we find Doncre still painting for the regime, this time celebrating the Peace of Amiens in 1802. After this he seems to have happily reverted by to his pre-Revolutionary mélange of historical and religious pictures, interspersed with portraits of society sitters. Perhaps more crucially for posterity, Doncre's position of trust allowed him a formative role in preserving the artist legacy of Arras throughout the Revolutionary period. 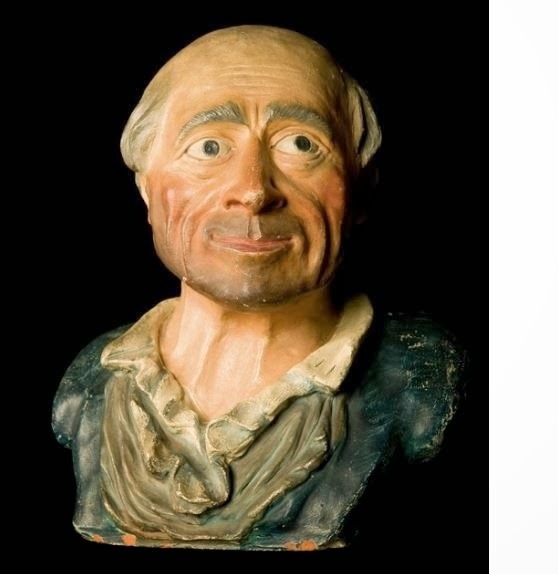 In March 1793 the district directory charged him with valuing works of art among the sequestered goods of the émigrés and in 1794 he became first curator of the museum in Arras, with a mandate to make his choice from the "works of religion and feudalism" in local churches, religious buildings and émigré households, in particular the great Abbey of Saint-Vaast. As his inventories in the Departmental archives of the Pas-de-Calais show, many medieval pieces now to be seen in Arras owe their preservation to Doncre. 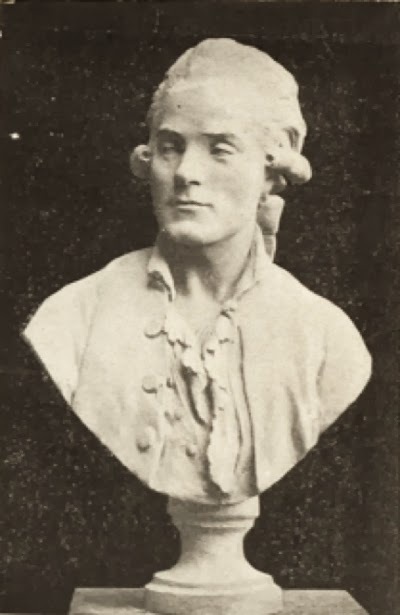 Dominique Doncre 1743-1820. Notice of an exhibition in 1989-90 in Hazebrouck and Arras. Charles Oulmont. Notice concerning a drawing (la sanguine) by Dominique Doncre. Bulletin de la Commission départementale des monuments historiques du Pas-de-Calais (Arras)1889-1981. 5th April 1906. 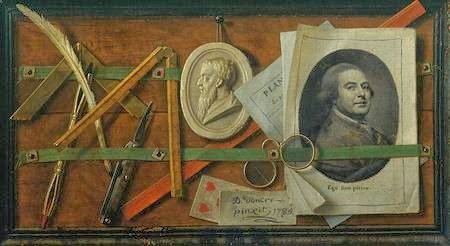 This trompe l'oeil by Dominique Doncre, the artist of the Le Bon portrait, is an attractive 18th century work. In a pleasant, self-regarding way, Doncre has painted the (seemingly) random content of his own work table. I particularly like the "picture within a picture" with the plump complacent face of the artist on its pretend engraved page; in case we have any doubt who it is, Doncre has added "ego sum pictor"! His signature and the date, 1785, are painted on the mock card below the splendid Ben Franklin specs. The painting seems to be just a virtuoso piece, no hidden moral, with no lurking vanitas messages. Doncre was a prolific producer of decorative pieces, trompe l'oeil, still life, grisaille and the like, but this is one of the few pictures on display and generally acknowledged as one of his best. We know that the young Boilly, later an accomplished trompe l'oeil artist, was in Arras at the time though whether he was a pupil or rival is not quite clear; in either case Doncre may have felt the need to display his mastery. 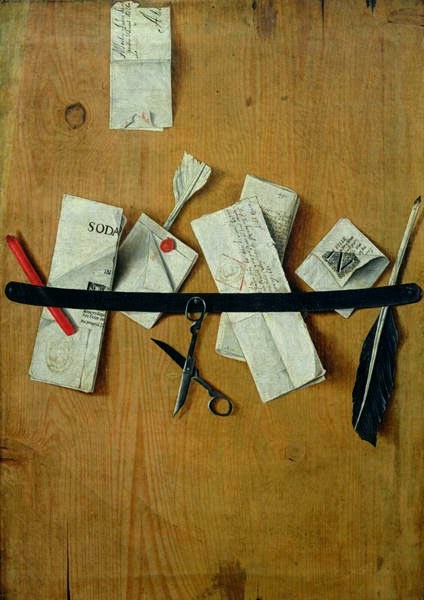 Trompe l'oeil was particularly associated in the 17th and 18th centuries with the Low Countries and Northern France. Doncre himself was Flemish in origin and may have studied in Antwerp. The Musée des Beaux-Arts in Arras has this splendid, and much earlier work by Jean-François de Le Motte dating from 1667, which is very similar to Doncre's composition. 10 August brought the Lyon "Jacobins", supported by the popular clubs, to power. On his return Chalier was named president of the tribunal of commerce, and took part in the electoral assembly which chose the deputies for the department of Rhone-et-Loire for the Convention. 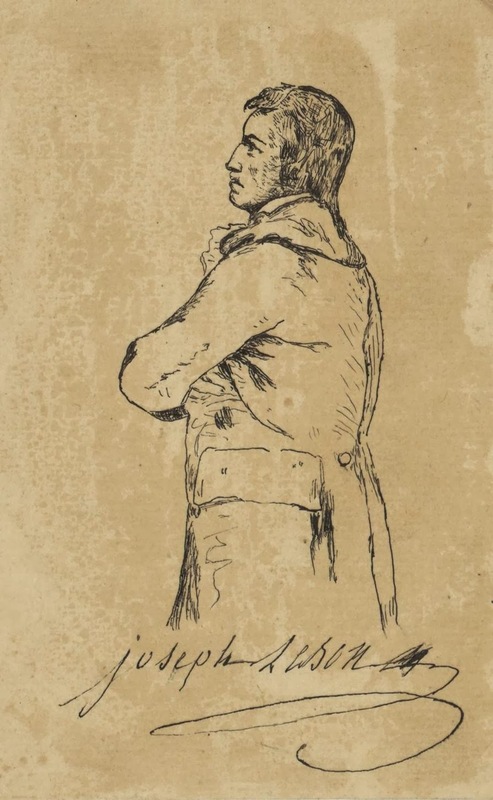 In November 1792 the Jacobins gained effective control of the municipality, though margins were small -the only failure was Chalier's failure to be elected mayor..
Chalier's official position was now, however, strictly subordinate to his role as unofficial figurehead of the radical Club central, set up just off the present Rue du Bat d'Argent near the town hall, which brought together delegates from the popular clubs of the twenty-nine sections of the town. An effective political organ, the Club central held rowdy public sessions which were publicised via a Journal and passionately followed by a widely politicised crowd of shopkeepers, artisans and workers. 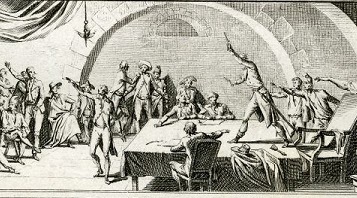 Chalier, procureur of the commune of Lyon proposes to the Club central, on the 6th February, to seize all the rich of Lyon and chop off their heads" Engraving; Musée Carnavalet. It is hard, of course, not to feel that Chalier was entirely carried away by his own rhetoric beyond all rational assessment. But he was not alone. Against a background of economic dislocation, popular suspicion and uncertain allegiances, mass hysteria was never far from the surface. On 9th September, only shortly after Chalier's reappearance in Lyon the fortress of Pierre-Scize was attacked and eleven prisoners lynched in a local version of the September Massacres. A week of chaos and disorder followed, in which shops and bakeries were ransacked. Chalier was accused of inciting the crowd, which seems probable, though there is no corroborating evidence. 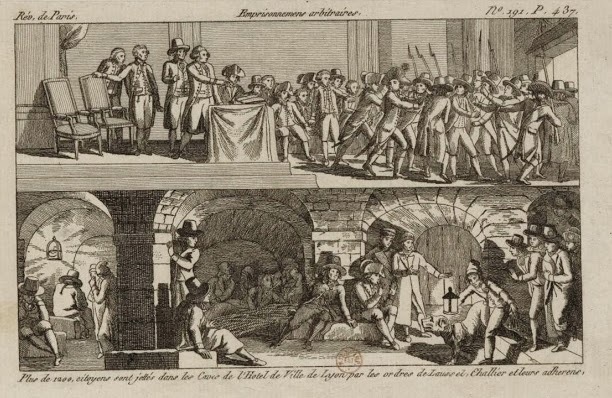 The massacreurs were almost certainly sheltered by the Club central and according to the former mayor Louis Vitet Chalier won popularity by indulging in violent eulogies of their deeds (letter to Roland, 11 September 1792). From December 1792, we have Chalier's suitably bloodthirsty verdict on the fate of Louis XVI; Brutus, he proclaimed, had no need of a trial - twenty blows of the dagger and Rome was freed. In January 1793 he was in full flow celebrating the death of the "tyrant Capet" with a sweeping vow to exterminate "aristocrats, feuillants, moderatists, egoists, speculators, usurers and fanatical priests". Meanwhile in the streets violence continued, with clashes between youths and petitioners for the king's execution. Assessment of the policies of the Lyonnais Jacobins reveals that they echoed closely those of the Parisian popular movement - price control, direct democracy, punishment for hoarders, terror against counter-revolutionaries and vigorous prosecution of the war. Despite Chalier's later canonisation as "patron of the poor" and his opponents' claims that he supported "redistribution of wealth", he represented the unique socio-economic conflicts of Lyon only in the peculiar animus of his vendetta against "the sect of merchant counter-revolutionaries". 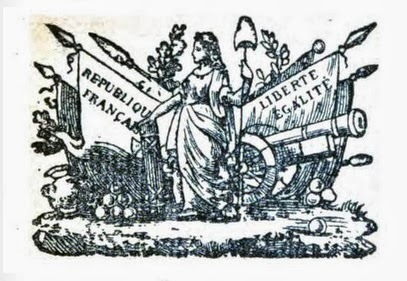 The Jacobins essentially exalted political equality - the speeches of Chalier's fellow-Jacobin Achard celebrated "this liberty which secures equality for you" and promised that "the simple tiller of the soil will be raised above the opulent egoist" - but didn't really want economic levelling. Identification of the "mercantile class" with counter-revolution justified economic measures against it, but these were seen as temporary expedients, for example taxes to meet costs of volunteers for the army. Chalier backed a maximum on grain and bread prices but the municipality lacked the capacity to do more than continue its predecessor's policy of subsidising bread and prices remained high. the Town Hall in Lyonon the orders of Laussel, Chalier and their supporters. Anonymous engraving. 1793 .Bibl. Nationale. The Jacobins did little better as effective exponents of terror. In February 1793 the Club central and its adherents in the town hall organised the arrest of several hundred "suspects" and - in a dramatic closed session on 6th February - called for the establishment of a revolutionary tribunal to judge "all the enemies of equality" starting with the moderate members of the municipality. This was the occasion of Chalier's memorable and melodramatic demand that the guillotine be set up on the pont Morand and the bodies of the executed thrown in the Rhone. Slightly surreally, the meeting even laid down the formula for judgement; the president of the tribunal must break in two a a loaf of bread with the solemn pronouncement, that it is as impossible for the condemned to remain on the earth as for these two ends of bagette to rejoin - to the bridge with him! 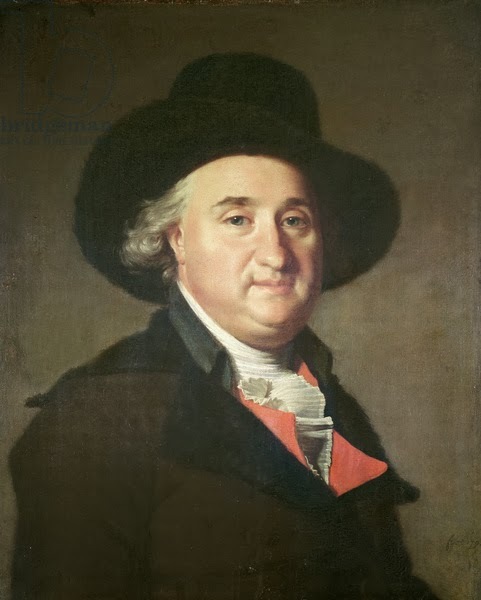 The mayor Nivière-Chol at first complied with house-to-house searches and arrest of suspects but demurred at the establishment of a revolutionary tribunal and guillotine. Happily pieces of the guillotine were at this stage stashed safely away in three different locations. .... Aristocrats, feuillants, moderates, egoists tremble! At the first attempts you make against liberty the bloody waters of the the Rhône and Sôane will carry your bodies to the terrifying seas.". Histrionic to the end : The last words of Joseph Chalier in prison in Lyons: "Why are you crying? Death is nothing to him whose intentions are just and whose conscience is clear." Engraving by Tassaert from a design by Caresme, Bibl. 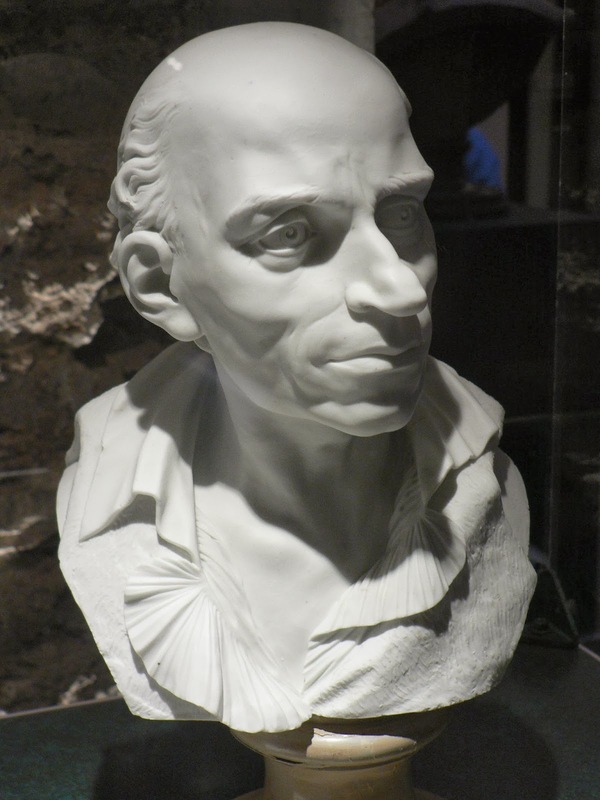 Nat..
Chalier, leaving prison for the scaffold; addresses his friend Bernascon.in the presence of his companions in misfortune, these remarkable words: "Friend, I know your heart: you are made for me and for liberty, do not grieve. You know my most secret thoughts my soul is fully revealed to you". Engraving by Carpentier; engraved by Marchand, Bibl. Nationale. And so the arrests began. Chalier refused to flee and on the morning of 30th May was sleeping soundly when they came to take him. He was paraded through the town, from his house to the arsenal, from the arsenal to the town hall and finally to the Roanne prison on the opposite bank of the Sôane. Everywhere he was met with a barrage of hate. In despair at this reception he attempted suicide by swallowing a pocketful of nails and a ball of his own hair (that's what it says I think!) but he soon rallied, considering it less cowardly to be put to death than to seek it at one's own hand. He remained in prison for six weeks, in the course of which he wrote much - mainly letters to his friend Bernascon, a Piedmontese plasterer, which were later published. At first he appeared stunned, lamenting his plight and begging his friends to make representations to the Convention and the Jacobins of Paris on his behalf. He complained that he was harshly treated, kept in the dark, guarded night and day, that everyday at midnight ten or twelve soldiers would arrive to make a show of leading him out to execution. 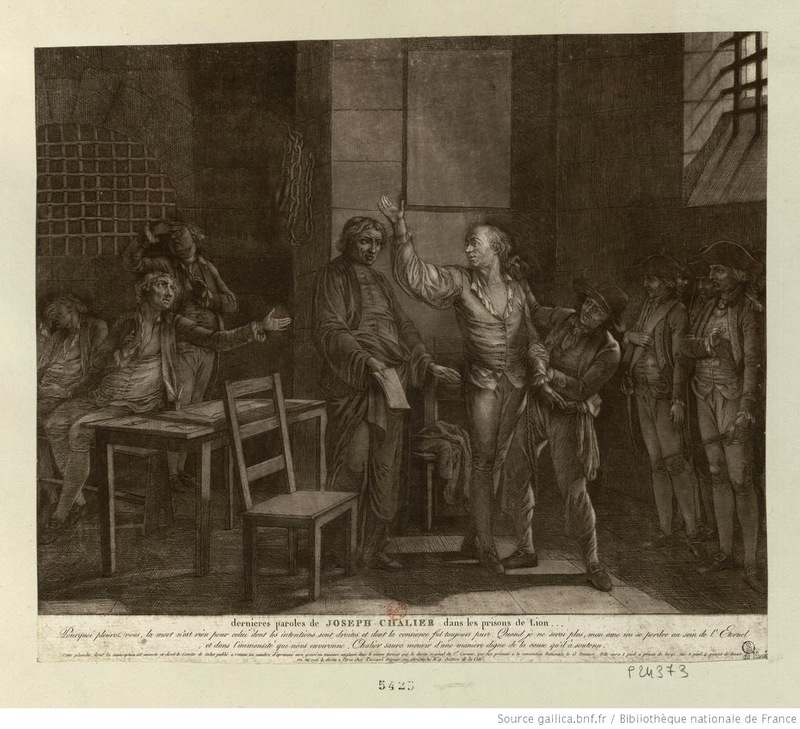 He occupied himself with his affairs, with the house that he had constructed in la Croix-Rousse district, and with comforting his housekeeper / mistress Pie, who "did nothing but cry".Bernascon and his friends planned futilely to break him out of prison. 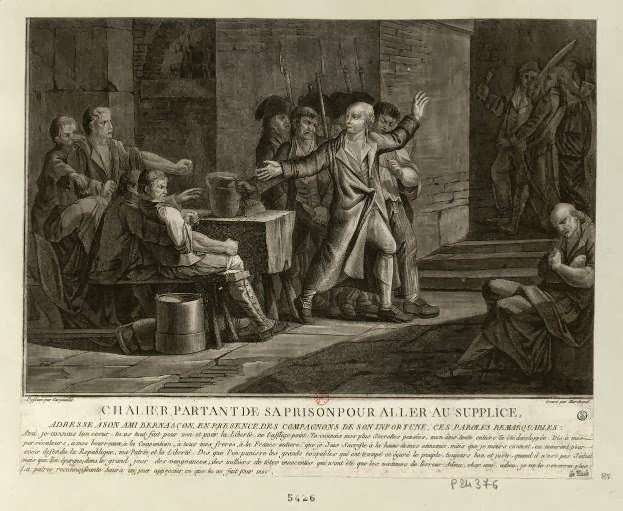 Other Jacobins likewise awaited their fates; the ex-actor Gaillard committed suicide and another municipal officer Sautemouche was acquitted but lynched by a vengeful mob. On 15th July Chalier's trial opened to packed crowds.Such was the hostility toward him, that the women Marteau, Pie and Madame Bernascon, who had come as witnesses for the defence, fled in terror. Only Bernascon himself was able to make himself heard. Chalier himself was shouted down when he tried to speak. Moulin the lawyer for the defence answered the accusations of incitement to murder and pillage skilfully, presenting Chalier as a sincere enthusiast and recalling his life of sobriety and devotion to duty. Chalier himself mustered calm and dignity, even sleeping through the deliberations of the jury. It was not until four in the morning that the condemnation was pronounced before the huge crowd - 10,000 strong it was claimed - which had waited up for the verdict. Chalier was allowed to return to prison to finalise his will and say for his last goodbyes. He found courage for one last dramatic performance and went to his death bravely, requesting the constitutional priest who accompanied him to testify that "I die for liberty, that I would be happy if my death and my blood could consolidate it." He began to address the crowd, asking that he might be only victim and others pardoned; he was drowned out by the drum roll. Maurice Wahl, "Joseph Chalier: Etude sur la Revolution Française a Lyon"